Championing this cause in the British scene, the increasing interest in it and what can be achieved. Union Pacific 10ft x 4ft American HO switching layout, with room to breath, and nicely finished inspired by a freight only branchline railroad in northern Utah. An earlier key article first published in SMT6/88 about another development of John Allen's original Timesaver; and covering also the 'playing card' method of operation. With additional notes. 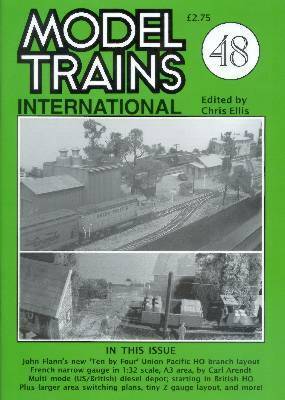 As the authors put it their aim was 'to produce a functional and highly operational low cost and low maintenance OO/HO model railway to fit under a single bed representing a diesel motive power depot'. Mid seventies, suitable for both US and UK outline. ' With notes on the operating system used. Compact scenic terminus and nicely modelled Swiss layout in HO with both standard and narrow gauge, built on two 4ft x 15in boards. Micro layout built in OO for the A3 Challenge competition, set in Suffolk, UK, and based on prototype hospital railways. A look at the beginning of the now common 'fiddle yard' idea with a reprint of A R Walkey's 1937 Model Railway News article on the subject. Either through or behind buildings are two means. Three schemes for prototypical style a shortline, industry line or freight yard operation 10ft 6in x 8ft 6in, 15ft x 1fy, 10fy x 6ft. Recent experiences recounted of making a start in British HO, with useful information on where to start, the British 1:87 Scale Society and adapting old Lima stock with new wheels and Kadee couplings. A simple conversion of the Skaledale Hubbard's Mill model to produce a useful on-line commercial facility. German shunting layout on a 12 inch ruler! A3 Challenge; Micro layout set in France with dual gauge track on one siding. Totally scratch built stock and buildings.